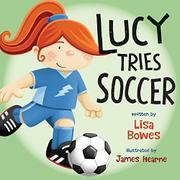 Soccer is the latest sports endeavor for spunky, industrious Lucy. In this newest entry in the Lucy Tries Sports series (Lucy Tries Luge, 2015, etc. ), Lucy ventures onto the soccer field. Under the guidance of a friendly coach, Lucy and her friends apply their fledgling skills in their first three-on-three game. In jaunty rhyming text, Bowes captures the exhilaration of the game, building the anticipation as Lucy’s team works collaboratively on the field. She introduces common soccer terms, detailing the various skills the players use in preparation for and during the game. Emphasizing teamwork and good sportsmanship, the tale focuses on Lucy’s enjoyment of the game. Descriptions of Lucy’s behavior on the field and on the sidelines present a positive example for young players. A “Fast Facts!” section provides further information about soccer for interested readers. The book’s design includes text with various words and phrases highlighted in bold, eye-catching colors, accompanied by sunny, upbeat illustrations. Hearne’s artwork captures the energetic enthusiasm of Lucy, a redheaded white girl, and her racially diverse friends. The cheery pictures of these young athletes wholeheartedly playing and learning the sport aptly convey the global appeal of soccer.